Did you know that today is National Peanut Butter Day? Say what?? I love pb and was inspired to make some cookies today. I decided to jazz them up with a simple chocolate glaze. 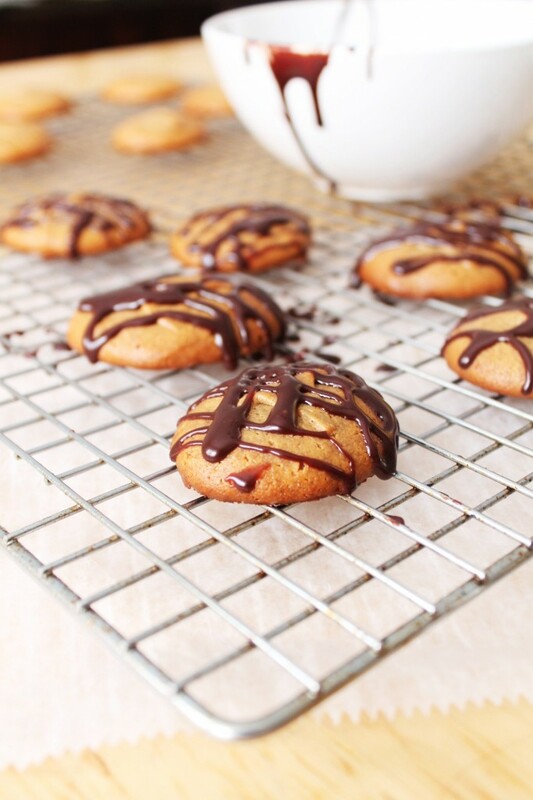 Here is my SUPER simple peanut butter cookie recipe that is naturally gluten free! Mix together pb, honey and egg. Combine well. 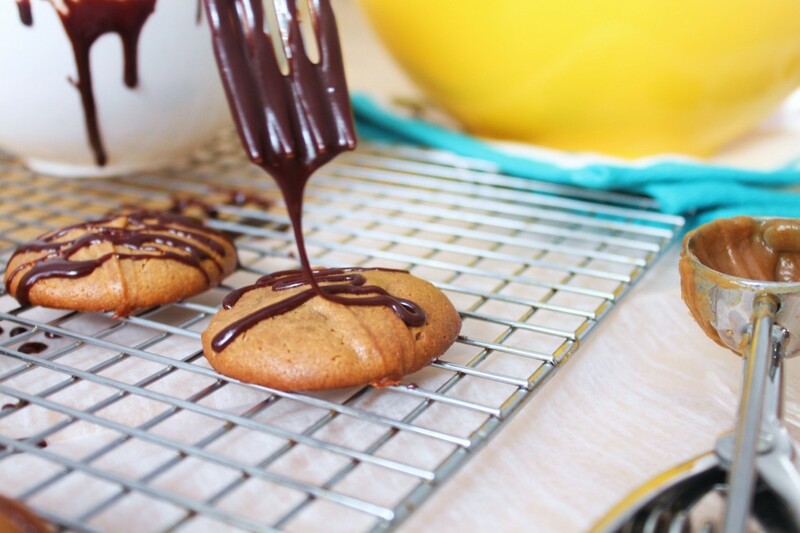 Let thicken, then drizzle onto cooled cookies. I love how simple this is! Can’t wait to try. There in the oven right now. I made a few changes. I halfed the recipe. The batter was the consistancy of peanut butter so I added 3 tbs flour. I also sprinkled cinnamon on top before baking! How did your cookies come out with the addition of flour? Are they cookies crunchy or chewy? Sorry I’m late in replying! The cookies were puffier and sooo delicious! Sorry I’m late in replying! The cookies were puffier and more airy! I cut my peanut butter down by about 1/3 a cup, but I did add half a banana and a packet of instant apples and cinammon oatmeal. I baked at 350 for 15 minutes. They came out “fluffy”–not chewy and not hard. More “cake” like. I enjoy them. And, they make me feel like I’m not eating something really fat. I would have just dipped my spoon in some peanut butter and drizzled it with honey for dessert anyway–this is way better. Plus, I’m saving the rest for my husband who will totally benefit from these after a workout. Plenty of protein! Yay. 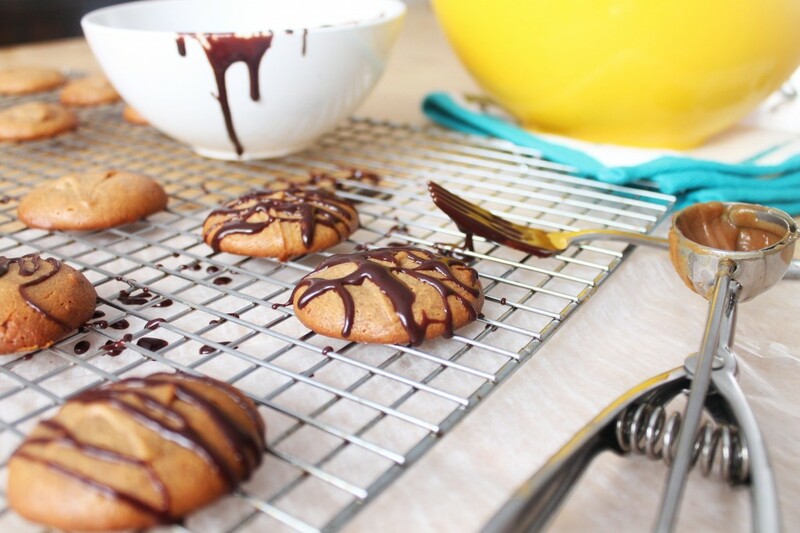 I made these cookies and they’re addictive. They are not too sweet (I didn’t use the chocolate glaze) and perfect when you’re in need of a snack. I have one question though, can I use almond butter in place of peanut butter the next time I make these goodies? Hi, What is the shelf life and should I refrigerate? Do you happen to know what the calorie count/nutritional breakdown of these are? I just made them, except I cut down the recipe to like 1/4′s just to try it first.. I also added a couple sprinkles of coconut flour and stevia (I know, I know, not allowed in the paleo diet but I tweak mine a little LOL), and a couple of pieces of bananas. I’m thinking mine are probably like 200 cals per cookie.. the natural pb is def high in calories.